Having a baby? Have a baby shower coming up? Well, if not, Christmas is! I've found the perfect, affordable homemade blanket for you! 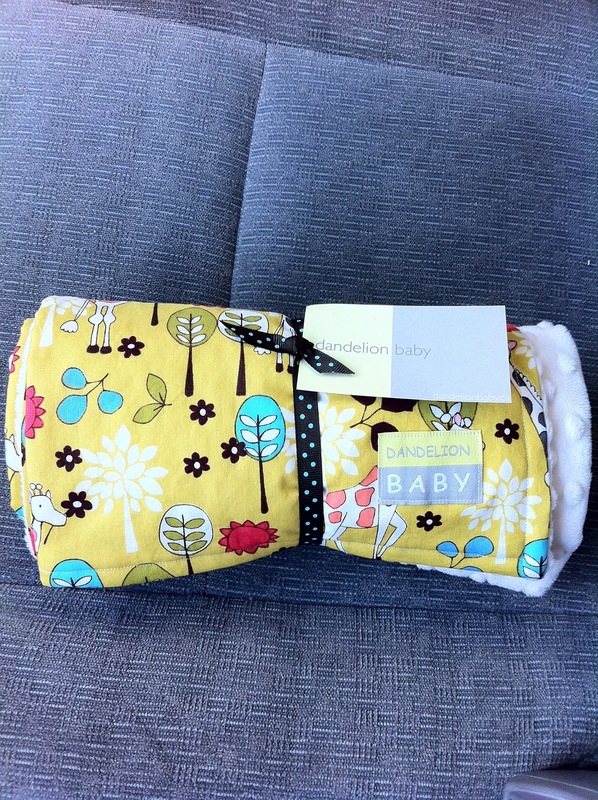 Dandelion Baby Blankets are the perfect blanket for snuggling up to any day. I wish I had one my size! lol! A baby and a little child can never have too many good blankets in my opinion. 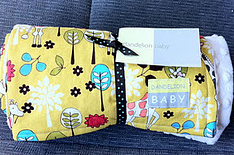 Dandelion Baby Blankets are blankets (blankies) your child can not resist. 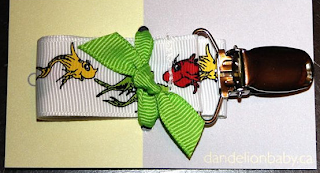 The Dandelion Baby Blanket shop carries not only variety of fine blankets but other handmade baby items as well: blankets for swaddling, blankets for strollers, heavy weight blankets, patchwork blankets, bibs, crib bedding sets, nursing covers and pacifier clips. They are all very cute and sure to please. 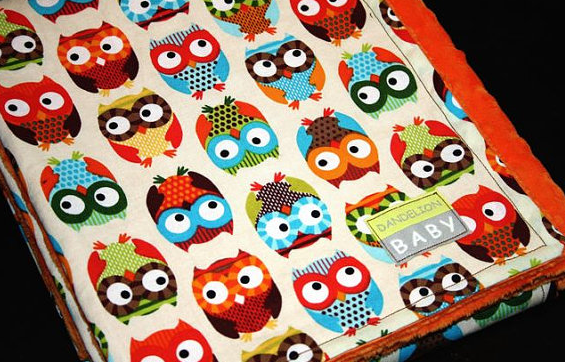 One reader will win a $25 Gift Certificate from Dandelion Baby Blanket! US and Canada only. Giveaway will end Tuesday, November 29th at midnight MST. Winner will be chosen by Random.org. I was given a blanket to review, no other compensation was received. Email addresses will be deleted after giveaway. Your privacy is important. US & Canada residents only. I love the dandy dots in sweet potato with white minky. So cute! I love the Bright Owls with orange minky. Adorable! I love the Extra Warm Cotton & Minky Baby Blanket -Pink Giraffes! So cute! I absolutely love the stroller blanket in Lime Giraffes with white minky! 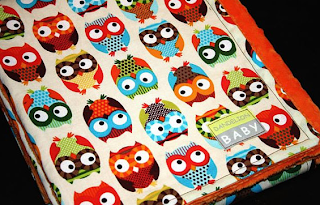 My favorite blanket is the Baby Blanket Bright Owls with orange minky. i love the warm winter blanket! but honestly it was so hard to choose one!! i LOVE them all! I love everything but I especially love the June Bug Patchwork Cotton & Minky Baby Blanket! My favorite is the Baby Blanket - Beep Beep in Lime with white minky. I love the pink baby blanket pink starling. I loved several of the blankets on this site. They are pricey! I like the Modern Meadow Baby Blanket. So pretty. kristiedonelson(at)gmail(dot)com Thank you. The Extra Warm Cotton & Minky Baby Blanket with Pink Elephants is adorable! 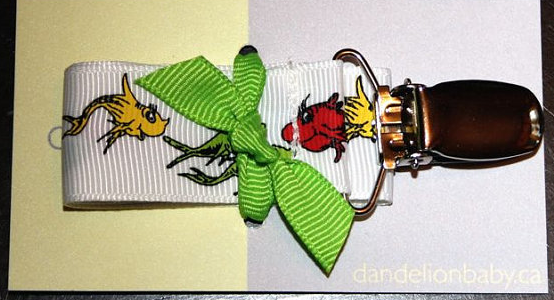 I love the Pacifier Clip - Pink and white daisy's on brown! My favorite thing in the shop is the Groovy Guitars cotton and Minky Stroller Blanket. Super cute! I like the June Bug Patchwork Cotton & Minky Baby Blanket in pink, fuchsia and cream. I love the Cotton & Minky Patchwork Blanket modern meadow in pink!! So hard to choose between them! I like the owl blankets but haven't decided which one I like best! My favorite item is the Extra Warm Baby Blanket Pink Elephants with white minky. I love to decorate with elephants!